Release Date:03/01/2019;Notes:Vinyl LP pressing. 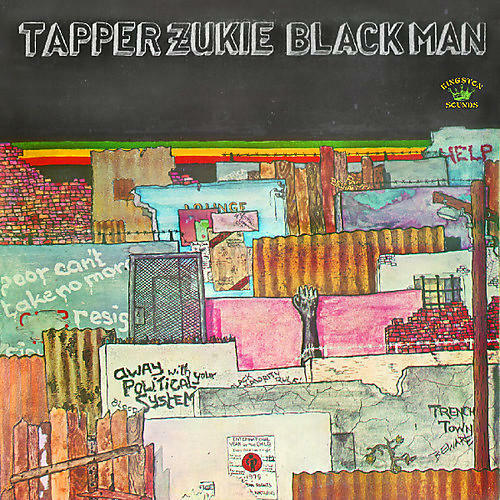 Kingston Sounds present a reissue of Tapper Zukie's Black Man, originally released in 1978 as a Jamaican-only release on Tapper's Stars imprint. Long deleted, it has become a classic in Mr. Zukie's vast canon of musical biscuits and is well overdue this worldwide release for the first time. Tapper Zukie (b 1956. David Sinclair, Kingston, Jamaica) was raised in the rough and tough West Kingston area of Jamaica, between the districts of Trench Town and Greenwich Farm. Living pretty much on the streets from an early age, the youths including the young Tapper had no choice but to fall into the hands of the political parties that controlled various ghetto areas of the town. Music seemed like the only way out of a life of crime and gang culture. A path that Tapper Zukie found by the mid-1970s was establishing himself as a named star on the DJ Roots circuit. Back home in Jamaica he was also getting a name for his production work for other local singers such as Prince Allah and the group Knowledge. To release these productions and his own material in Jamaica, Tapper started up his own label called Stars. It's this label that saw the initial release of this album Black Man. A great collection of Tapper tunes such as his biblical cut "My God Is Real", "Revolution", the title track, and some work overs of some of his fellow Jamaican artists like "Poor Man Problem", a work over of Johnny Clarke's "Blood Dunza" and also Mr Clarke's "Leggo Violence". "Yaga Yaga" is a re-working Horace Andy and Tapper's big hit "Natty Dread Ah She Want", and "Gather Them" is a reworking of Knowledge's tune of the same name with the help from bands like Jah Wisdom and Delroy Fielding. A great collection of tunes and reworkings that will hopefully find a wider audience with this reissue.